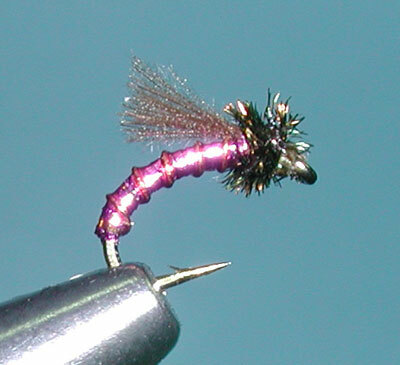 Notes: Not sure who came up with this pattern but on the San Juan River in New Mexico, this pattern is known as the Disco Midge. 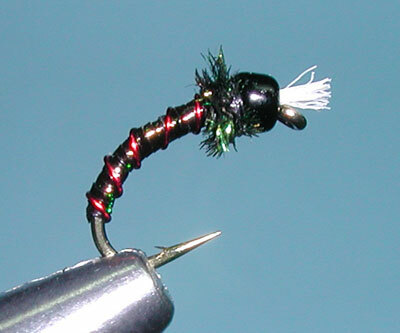 The fly takes it's name from the "Disco Era" of the 1970's with the flashy body of Flashabou or Krystal Flash. On the San Juan, it is tied in sizes 18-24. The use of Flashabou or Krystal Flash for the body is it's trademark. Colors used are Olive, Pearl, Pink, Red, and Green. The Thorax is generally Peacock Herl, although some patterns will use a dubbing or just thread for the smaller sizes (20-26). A fine ribbing wire is also optional and is used to highlight segmentation as well as some additional weight. A coating of SuperGlue over the body will extend the life of the Flashabou and will also enhance the translucent appearance. A number of variations have been derived from this pattern. 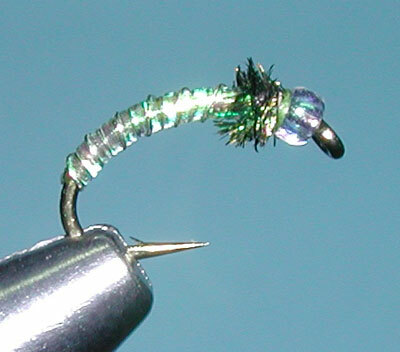 If you add a couple of CDC feathers behind the eye, before applying the Peacock Thorax, you get a CDC Midge Emerger. These can be quite effective in color patterns of Pink/Copper, Lime Green/Gold, Pale Olive/Gold, Black/Gold, Red/Gold and Pearl/Copper. Philip Rowley of British Columbia, Canada came up with a very similar pattern variation that he calls "Pearl Pupa". 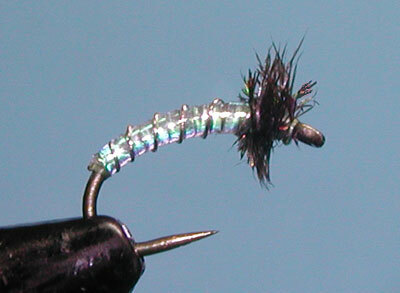 His pattern utilizes the same body materials as the Disco Midge but he adds a Pearlescent Glass Bead for the head. Chironomids are much larger in the Canadian stillwaters than a New Mexico tailwater river, so his patterns are tied in sizes 12-14 (large enough for a Glass Bead). The glass bead suggest trapped air as well as the white gills on emerging pupae. 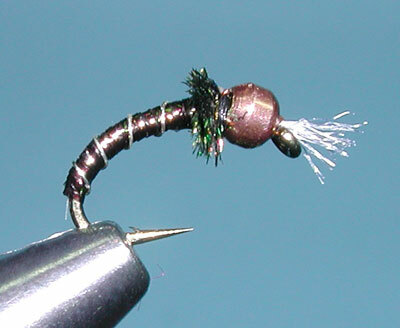 Brian Chan also provided another variation to the Disco Midge by adding a tuft of Antron extending beyond a beadhead. This gives the appearance of gills that are often associated with Chironomids. 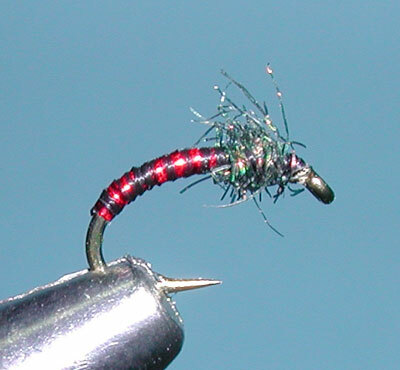 Chan's Red and Black BH Chironomid Pupa utilizes Frostbite, Krystal Flash, Flashabou, or Super Floss for the body with a bright Red Wire ribbing. His Frostbite Chironomid Pupa uses a Silver Wire ribbing with Copper bead. Frostbite is very similar to Krystal Flash. It comes in spools with two strands woven together. Brian separates the strands and uses it to provide a thin translucent body which can be over a thread or dubbed underbody. You'll find two patterns to his Frostbite Chironomid Pupa. The one shown on this page is his version from his book, "Morris and Chan on Flyfishing Trout Lakes". Another version, trademarked by Umpqua Flies, has a more complicated thorax with a Pheasant Tail wingcase and White Antron placed perpendicular to the hook shank so that the gills protrude from the side. Within the Sierras, we tend to use sizes #16-20 and this size also allows us to use beads. Small glass beads are available as well as micro metallic beads in Gold, Silver, Black, and Tungsten. The metal beads give the pattern a jigging effect upon a slow retrieve. 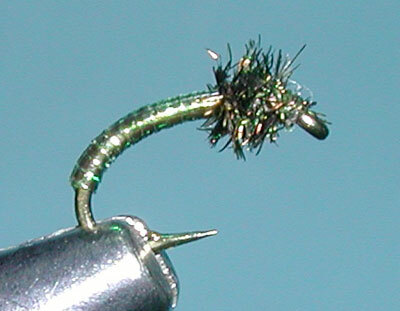 It is considered a chironomid emerger pattern similar to the WD40 and RS2.